419 by Will Ferguson ~ 2012. This edition: Viking, 2012. Hardcover. First Edition. ISBN: 978-0-670-06471-7. Winner: 2012 Giller Prize, for best Canadian novel or short story collection published in English. 399 pages. My rating: 8/10. Quite a lot better than I had anticipated. Ferguson’s last few efforts have left me mildly disappointed, but this new novel encouragingly shows that he is still growing as a writer. I haven’t yet read any of the other Giller Prize nominees, but 419‘s win a few nights ago no longer seems so far-fetched. This is a well-written and ambitiously plotted novel, and the writer exceeded my personal expectations this time around. I didn’t love this book, but I did like it – very much. Though I do have more than a few critiques, some of which I’ll address below. I like being pleasantly surprised, and this book did just that. I’d read quite a few reviews, and I’d heard that it was nominated for the Giller, but I wasn’t particularly eager to delve in, as I’d earlier found Will Ferguson’s last book, Canadian Pie, disappointing. It felt rather repetitive, with some of what seemed like reworked material from earlier books, though some bits were excellent entertainment, as always. But the distinctive cover of 419 caught my eye on the “New Books” display as I was heading out of the library on Tuesday evening, so I impulsively stopped and added it to my pile. When I got to car, I heard the announcement on CBC that Ferguson had indeed just won the $50,000 Giller for 419, and I mentally shuffled it to the top of my to-read pile, and started it that same night. I found the narrative initially confusing, as the author has a number of different storylines on the go from page one, but it soon started to jell, though I didn’t ever shake the feeling that I occasionally had too many windows open on my mental computer screen. Would you die for your child? And we are suddenly at a car accident scene in a snowy Canadian city. Then in a sweltering African airport. In a mangrove swamp with a fisherman and his son. Back to Canada as a family learns of their father’s sudden death. Africa. Canada. Africa. Canada. What’s the connection here? Longer stretches of narrative are interspersed with mysterious vignettes, as the stage is set for the characters’ and events’ inevitable connections and intertwinings, and separate strands start to stand out. In Calgary, a retired school teacher has died in a troubling car accident. Was it an accident, or something more sinister? A daughter seeks the truth, and justice. In the same city, a police investigator tries to determine the truth about that death, and others, as he mulls over his own personal future. In Nigeria, a self-confident young man haunts the internet cafés, sending out thousands of tempting emails, waiting for the inevitable but rare “bite”. From peaceable beginnings in a fisherman’s family on the Niger Delta, a young boy becomes a man, moving into a vastly changed world as multinational companies start to extract the oily treasure hidden under the dense mangrove swamps. A mysterious scar-faced young woman stumbles through the sub-Saharan desert, hiding a secret and searching for a refuge as yet unknown. In Lagos City, a crime lord plays his victims like an obscene stage director, evil but ultimately doomed himself. 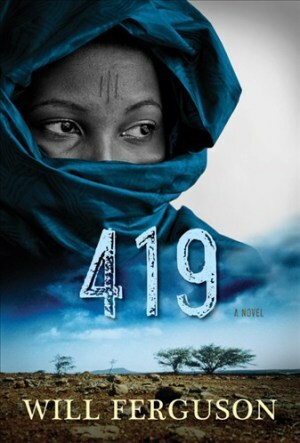 The plot is driven by the ubiquitous presence of the infamous Nigerian internet scam, the titular “419”, so named for the number of the article of the Nigerian Criminal Code dealing with fraud, which turns out to be a key – but not the only – plot element. Nnamdi was gripping the wheel, eyes on the road, barely blinking, barely breathing. His first time driving. Nnamdi swallowed down his nervousness, pushed a little harder on the accelerator. All in all, a blackly comedic suspense novel, but not to be taken too seriously, Giller Prize or not. What is the likelihood of a modern, middle class, apparently well-educated family being so totally unaware of the sophisticated nature of internet fraud? I could buy into the innocence of the father – sort of – because obviously people do fall for these scams or they could not continue to proliferate, and I know how trusting certain individuals can be, but the naïveté of the adult children, one an apparently financially savvy businessman, tests the reader’s credulity a little too far. The revenge element, the reverse fraud, the involvement of the now highly pregnant Saharan girl – these plot twists, and numerous others, had me shaking my head as the story reached its conclusion. Viewed as a semi-farcical novel, the flaws of logic smooth out and the “hang on a minute” moments are much more forgivable, but I didn’t ever get the feeling that this was the Big Important Serious Novel that some mainstream reviewers have made it out to be. Sure, there are some serious elements, and those lend poignancy to the tale, but to me it seems just another diversionary read, to be consumed with a certain gusto and set back on the shelf among all of the other well-wrought entertainments of the semi-serious sort. With this in mind, recommended. Good job, Mr. Ferguson, and congratulations on your prize. Nice thorough review of a book and author that is new to me. Thanks!